Saez, NJ., et al. The University of Queensland, St. Lucia, Queensland, Australia. Very few spiders are harmful to humans. However, some produce simple peptides* and proteins to catch their prey. Moreover, they carry diverse toxins with a wide variety of biological activity. Over 900 spider toxins are known (a small part of the total number). Their actions are neurotoxic, antiarrhythmic, antimicrobial, analgesic, antiparasitic, cytolytic, antitumor, hemolytic and enzyme-inhibitory. Venom from one species of spider (Macrothele raveni) is even antitumor. 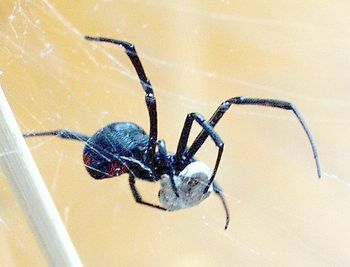 The black widow spider (Latrodectus mactans) causes neurotransmitter release. Many venoms alter the passage of calcium, potassium and sodium in and out of cells by way of “ion channels”, thereby causing paralysis. Whereas most dipeptides are unstable in the body, their stability is improved in spider venom by the presence of the mysterious inhibitory ‘cysteine knot’** (ICK). That stability is seen even at extreme pH levels and temperatures, making the dipeptides suitable for oral medicinal use. Treatments for chronic pain may be found in spider venom since ion channels are involved which can be blocked by spider venom peptides. Other illnesses which may be treated include stroke, depression, autoimmune diseases, multiple sclerosis, Huntington’s disease and Parkinson’s disease. Many studies are being pursued to see what uses can be made for sodium channel inhibitors. Other inhibitors work on calcium channels, and one targets the norepinephrine transporter to reduce post-operative pain. Blocking certain channels may treat atrial fibrillation. Certain spider toxins may treat erectile dysfunction by inhibiting sodium channel functioning. Some spider toxins have antibacterial and antifungal properties. One antimicrobial peptide is already being used as medicine. Some peptides work against Gram-positive bacteria, Gram-negative bacteria, fungi such as Candida albicans, and trypanosomes***. The peptides may be useful in treating malaria. CONCLUSION: Studies are showing that a wide variety of peptides are available in spider venom, with therapeutic benefits in impacting a wide variety of diseases. Many of these treatments are successful in oral doses. NOTE: *Peptides are proteins made up of short chains of amino acids. The shortest are dipeptides, made up of only two amino acids. **The ICK motif is a type of protein structure which resists degradation. ***Trypanosomes are a group of microscopic organisms which include the causes of Chagas disease and sleeping sickness.